The hip labrum is a protective ring of cartilage that is found outside the rim of the socket of your hip joint. 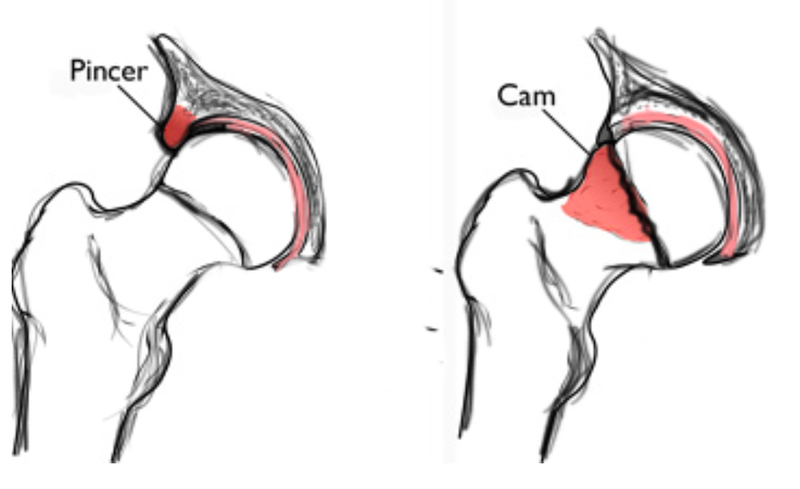 The labrum’s role is to hold the top of your femur securely within your hip socket. The labrum assists in shock absorption and stability of the hip. Tears can occur from trauma, impingement, or dysplasia. Symptoms usually present as anterior hip pain, “deep” joint pain or pain within the groin. It is also not uncommon for patients to also present with posterior hip pain. Typically patients will also experience a locking or popping sensation and stiffness with limited range of motion. This a condition where both the shape of both the acetabulum (socket) and femur are irregularly shaped. This causes the head of the femur to not fit into the acetabulum properly, subsequently causing damage to the joint. Bone spurs tend to develop along the joint on patients who suffer from FAI. These spurs can cause the hip bones to rub against each other causing a tear of your labrum and breakdown of articular cartilage. Frequently you will hear your physician say you have a “type” of FAI. This is found when there is extra bone along the acetabulum. When this occurs, the labrum can be sheared off the acetabulum. 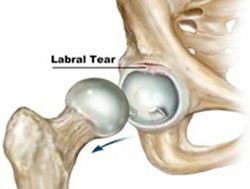 This is caused when the head of the femur is abnormally shaped and cannot rotate freely within the acetabulum, this causes a bump to form along the edge of the femoral head, grinding off labrum. Watch this video for further explanation from Dr. Wolff on FAI. Typically, Dr. Wolff does not suggest surgery until you have exhausted all conservative measures including, but not limited to, physical therapy, intra-articular (therapeutic/diagnostic) injections, and a steady course of non-steroidal anti-inflammatory medications. Surgery is not suggested unless you are symptomatic and the pain is beginning to interfere with the quality of your life. Dr. Wolff will correct the labrum by identifying it along the acetabular rim. He will then pass sutures through the labrum and attach plastic anchors, thus fixating it to the acetabular rim. After the anchors are fixated, the labrum is probed to assess stability. Click here to read a publication by Dr. Wolff on management of the acetabular labrum. A reconstruction is performed when the remaining labrum is insufficient in order for a repair to be done. A reconstruction is done by using a fascia lata allograft. During surgery the deficient or insufficient labrum tissue is removed, the defect is measured, and suture anchors are then placed within the acetabular rim to fasten the allograft. The allograft is designed to mimic your normal anatomy. ￼Click here to read more about this procedure in a write up by Dr. Wolff. This is the smoothing of any bone deformities that are a result of FAI, this can be done on both the femoral head/neck junction as well as along the acetabular rim. This is surgical removal of the synovial membrane. In FAI, the synovium can become inflamed and subsequently produce excess synovial fluid. This excess synovial fluid can eat away healthy cartilage on the joint surface, thus leading to joint pain. This is the process of smoothing irregular and loose edges of cartilage. Small controlled fractures of the bone are created to stimulate new cartilage to grow. If you like the videos on this page and website, please visit Dr. Wolff’s YouTube Channel to see more!